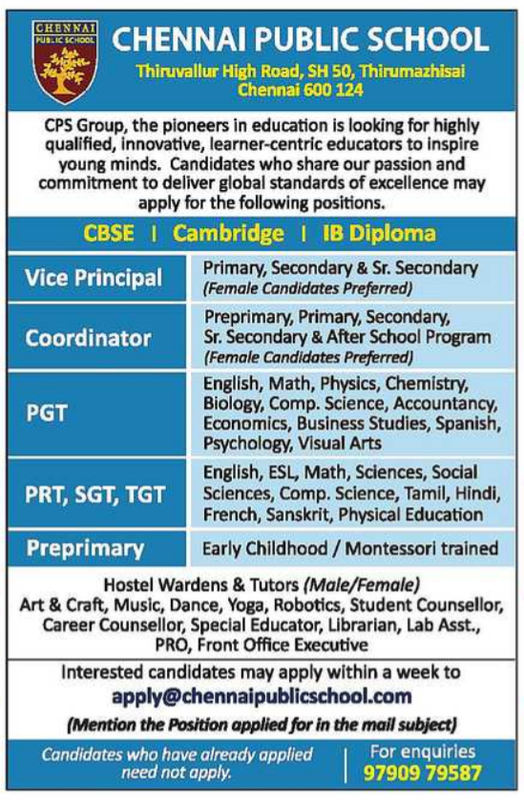 PRT,SGT,Pre Primary jobs vacancies. Interested and eligible job aspirants are requested to apply with in a week.Check out further more details below. 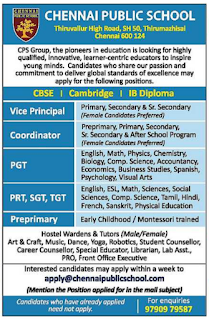 Name of the School: Chennai Public School, Chennai,Tamilnadu. About School:Chennai Public School is promoted by Kupidisaatham Narayanaswami Educational Trust (KNET) and governed by a Board of Trustees. Today, with more than 4000 students and 200 faculties under its wing, Chennai Public Group of Schools, are the most sought after new era schools in Chennai city, growing from strength to strength within a very short span of time since its launch. How to Apply: Interested candidates may apply within a week to mail id. Mention the position applied for in the mail subject. Candidates who have applied already need not to apply.